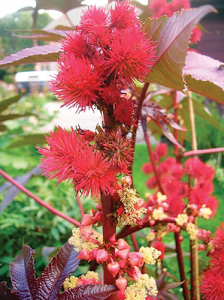 A number of oilseed crops happen to be good plants for bees, including the castor bean (Ricinus communis). Reportedly native to Africa and possibly Asia, this species now occurs in most areas of the globe. Also known as castor bean plant, it is often grown as an ornamental. The bold, showy, shrubby plant lends a tropical look to the landscape. Requiring minimal care, it is suitable for all regions of the country. Related to the poinsettia, this is a member of the spurge family. Normally in these columns I alternate between woody and herbaceous plants. However, the castor bean can be either one, depending on the climate. In colder areas, the plant can be treated as an annual. This is hardy in zones eight and higher. Castor bean has naturalized in many areas of the Old and New World, including some regions of America. It grows wild in the U.S. Virgin Islands and Puerto Rico. The plant is more likely to self sow in warm climates. This species has escaped locally in waste places in some states, including California, Utah, Arizona, Texas, Kansas, Missouri, Tennessee, Illinois, Ohio, Michigan, Pennsylvania, New York, Massachusetts, and New Hampshire. In addition, it can sometimes be found in parts of the South, the Southeast, and the Atlantic regions mostly from Louisiana northward to Virginia. In areas with short growing seasons, castor beans are six to eight feet in height, depending on the variety. Elsewhere, this can be a tender perennial that reaches fifteen feet in a single growing season. In tropical regions, it is a woody evergreen shrub or tree ultimately growing 40 feet tall. The species is mostly deciduous to semi-evergreen for it is damaged by even the slightest frost. The large, coarse looking plant features a sparsely branched, stout, smooth stem that is generally light brown to greenish with a whitish bloom. In some cases, this can be red. However, the color of the stem and leaf can vary widely from one variety to another. In the tropics, the stem can reach four inches in diameter. Castor bean has stout, rounded, toothed petioles, up to 1½ feet in length, with greenish-white margins. Mostly alternate, the large, toothed prominently veined, palmate foliage is quite large, ranging from 1¼ to four feet across. It typically contains five to eleven deep lobes. The leaf color can vary considerably. These can be green, maroon, purplish-bronze, reddish-purple, purplish-black, or dark metallic, according to the variety. Roughly star shaped, the pungent smelling leaves develop very prominent greenish-yellow to white veins. Those plants bearing green leaves will generally produce green fruit pods, while the red podded ones appear on red-leaved plants. The underside of the foliage is generally lighter green. Typically in colder climates, castor beans bear flowers from July through October, depending on the planting time. In Texas and other warm regions where this survives the Winter, flowering can begin as early as March or April. Castor bean often blooms year-round in the tropics. The seed pods are much more flamboyant than the blossoms. Lacking petals, the small flowers form dense, crowded clusters or panicles that can be one to two feet in length. These contain numerous, crowded, short stalked blooms. Though generally terminal, the flowers can occasionally arise from the leaf axils. Possible colors are yellow, whitish, greenish, or reddish-brown. The male blossoms emerge mostly towards the base of the flower cluster slightly earlier than the females. These feature a light green calyx and three to five lobes, numerous pale yellow anthers, and lots of crowded, much branched, fluffy, conspicuous creamy stamens. The greenish female flowers appear on the upper portions of the flower clusters. Only ¼ to ½ inch in length, these have three to five lobes, a light green calyx, a spiny, light green ovary, and plume-like, three bilobed, brownish-red styles. The burr-like, trilobed, castor bean pod is a large, soft, spiny capsule. Either smooth or shiny, these are elliptic and ¾ inch in length. They split when mature. The species generally bears greenish-white pods that ripen to brown. Some varieties feature red or pink pods. The Latin genus name refers to the tick-like appearance of the seeds. Often mottled, the oily, rounded, glossy seeds can be ovoid or ellipsoid. These can reach ½ to 5/8 inch in length, according to the variety. The seeds display assorted shades from silver or brownish-gray to brownish-red. One end has a prominent white dot. Some varieties produce seeds with spots or streaks. Castor bean blossoms are eagerly sought by bees. The plants produce lots of yellow pollen. 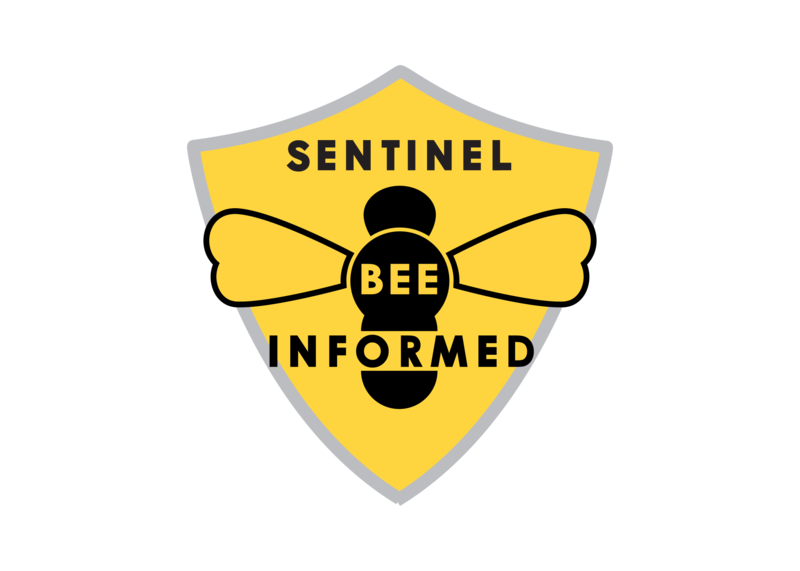 A South American study found that when the pollen comprises more than 10% of the bees’ diet that they tend to have shorter life spans. 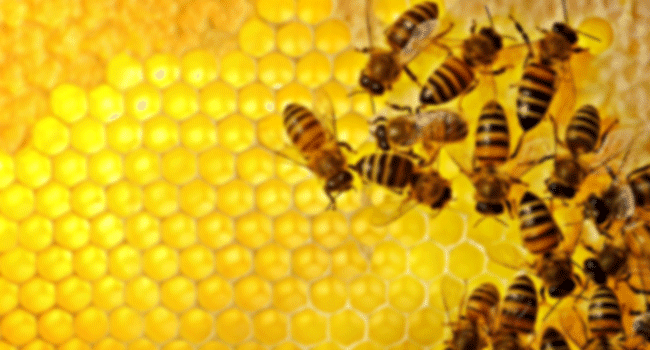 Castor beans can provide a honey surplus when enough of the plants are available. There appears to be some disagreement as to which plant parts are releasing the nectar. 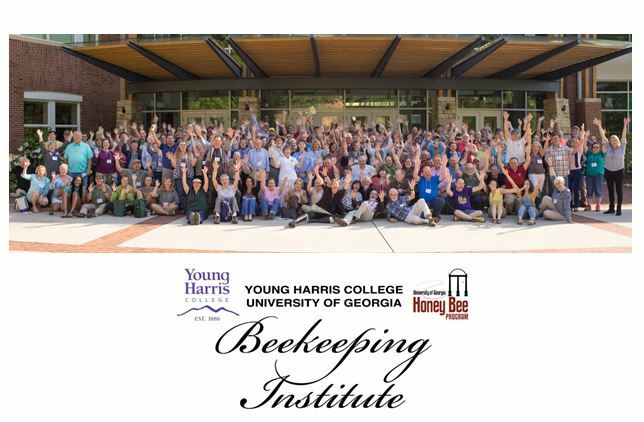 Some bee experts report it arises from extrafloral nectaries located at the base of the leaves. In addition, there are also nectaries on the leaf stalks and stems as well. 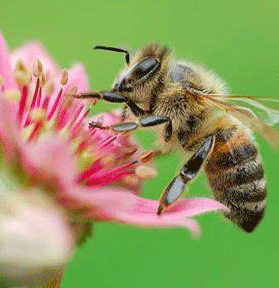 Bees also appear to collect nectar from the young seed pods. This is described as being liquid early in the morning and tending to harden as the day progresses, which is often the case with some sources of honeydew. 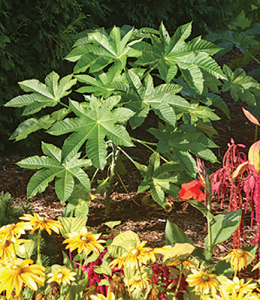 Easy to grow from seed, castor bean is most widely cultivated in tropical regions. This sun loving species generally needs a growing season of 90 to 150 days, according to the variety. 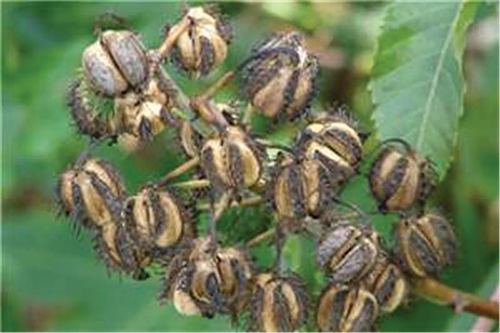 As ornamentals, castor beans are sometimes planted as an annual hedge or screen. Shorter varieties are suitable for large containers. Some gardeners grow this plant to repel moles although there is scant evidence that it is an effective deterrent. The seeds can be direct sown an inch deep after the danger of frost is past. In colder areas, castor beans can be started indoors six to eight weeks before the last expected frost. Since these resent transplanting, use large peat pots if sowing indoors. For best results, soak the seeds overnight before planting. Take steps to ensure that children and pets won’t come into contact with the soaking seeds as these are poisonous. Often, the seeds will sprout within a week to two weeks. However, in some cases they can take longer. These have a germination rate of about 85%. They sprout best when the temperature is a minimum of 69°F. Generally, castor beans should be spaced three to five feet apart, depending on the variety. The plants do best in a rich, well drained, moist soil. Suited to sandy and clay loams and most other soil types, these dislike constantly wet conditions. Although the plant isn’t drought tolerant, it does reasonably well in a dry soil. Fertilizer can be added when preparing the soil. For poor soils, an additional application of fertilizer during mid-Summer is helpful. Taller varieties of castor beans sometimes benefit from staking for they can blow over in areas that are particularly windy. 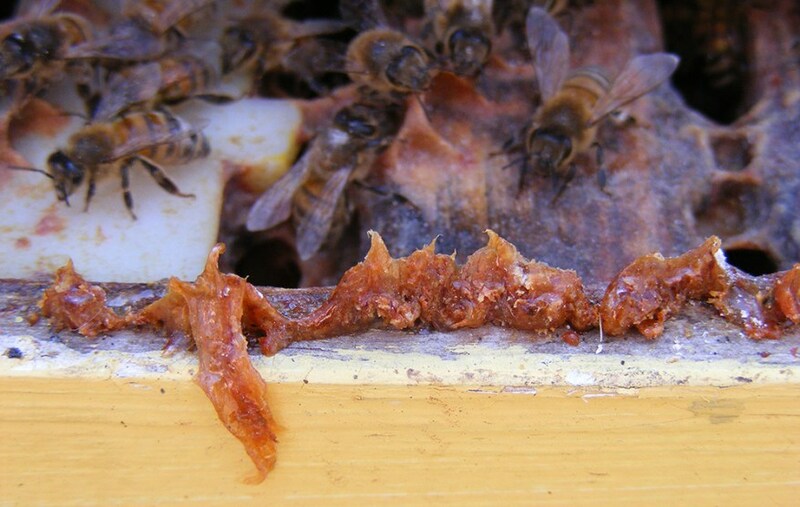 Since these plants are known to naturalize, beekeepers can prevent this by removing the seed pods before they split. Don’t allow the seeds to fall on the ground. Remove these from the plant, and discard them in the household trash rather than in the compost bin. A number of castor bean varieties are listed in seed catalogs, such as those of Baker Creek, Select Seeds, J.L. Hudson, Jung Seed, Richters, and Thompson and Morgan. 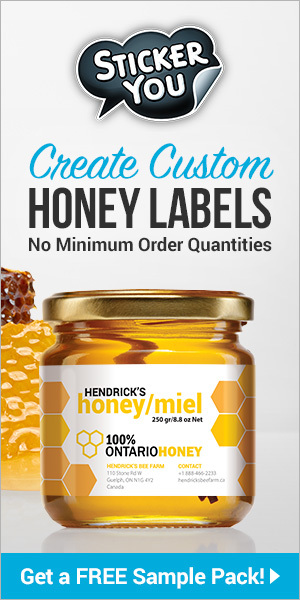 Some varieties that are available include the following. Zanzibarensis is an heirloom variety dating to at least the 1870s. This is by far the tallest – 15 feet. The thick green stems are covered with a violet or white bloom. This variety also bears some of the largest foliage – 2½ to four feet across. Typically, it features large, white veined leaves. Mostly green, these are sometimes bright red or bronze. 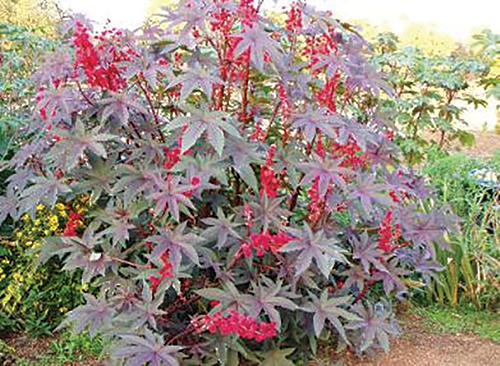 Originating in the Victorian Era, New Zealand Purple castor bean grows to eight feet in height. This variety is named for the deep purple foliage, stems, and the purple seed pods. There appears to be various strains of Carmencita castor bean. This dwarf, early flowering variety is only five feet tall or so. The stems are red. The leaf color varies according to the strain. When Carmencita seeds first sprout, the seedlings are initially green, changing color as they mature. Possible leaf colors include green, maroon, brownish-purple, and chocolate brown. The leaf veins are red or burgundy. Opening from vivid red flower buds, Carmencita flowers are typically red although they’re sometimes pink or orange. The seed pods are generally bright red with the exception being Carmencita Pink, which bears lovely pink pods. Sanguineus castor bean grows from eight to 10 feet in height. This heirloom, large seeded variety has been around since the 1940s. It bears very large, deep red leaves, bronze to blood red stems, and red seed pods. This entire plant is considered poisonous with one of its three poisonous substances being ricin. Typical symptoms upon consuming the raw seeds are diarrhea, vomiting, and abdominal pain. In a few cases, victims have suffered kidney or liver problems. Neurological symptoms can occur when the seed capsules or leaves are eaten. While castor bean oil is nontoxic, the raw seeds are harmful. Children appear to find the large, colorful, attractive, bean-like seeds very tempting. However, few fatalities have been reported, especially since the 1940s. Some deaths of adults were apparently suicides. Eating as little as two seeds can result in poisoning symptoms. George E. Burrows, author of “Toxic Plants of North America,” concludes that “the dangers of the seeds are often overstated.” Assuming proper medical care is provided, poisoning victims typically recover after eating the seeds. 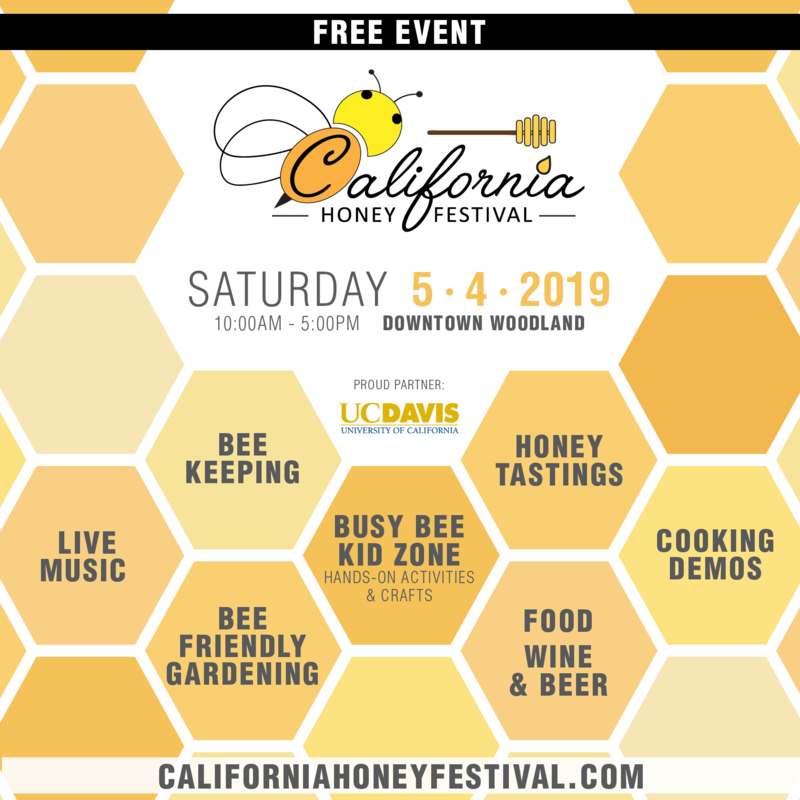 Yet, there can be some variation in the severity of the symptoms, based on the individual’s response, the quantity consumed, and whether the seeds were ground or whole with the former being much more toxic. A number of animal species has experienced poisoning symptoms from castor beans, which usually isn’t fatal. Those affected have included poultry, goats, sheep, cattle, pigs, rabbits, horses, and household pets. Contact with the leaves and seeds can cause a skin rash in some individuals. This can be avoided by wearing long sleeves, pants, and rubber gloves when working around the plants. This plant has been used as a source of insecticide. Despite that, the leaves have been fed to silkworms, which appear to be immune to the toxic substances the plant contains. The stem pulp has been made into paper. The pomace from the seeds is used as a manure/fertilizer. The seeds contain about 50% oil by weight. This oil has long been used for medicinal purposes – mainly as a laxative. In addition, it shows up in the manufacture of various products. These include lubricants, soaps, lamp oil, hair and leather dressings, candles, cosmetics, plastics, textiles, rubber, linoleum, paint, varnishes and other finishes, ink, coolants, oilcloth, ointments, waxes, and polishes. In some cases, the oil is used as a flavoring for certain foods, such as baked goods, candy, frozen desserts, and drinks. It is also added to butter. In Nigeria, the fermented seeds are eaten cooked in stews and soups. Castor bean has been cultivated since 7000 B.C. or so. The seeds have been found in ancient Egyptian tombs. The ancient Egyptians used the oil for lamps and for certain medicinal purposes. This species was introduced to Europe around 1548 from the East Indies. In Spanish-speaking nations, the plant was called Palma Christa during the Middle Ages. This was widely grown in Victorian flower gardens. European colonists brought the seeds to the New World. In the early 1900s, castor bean was widely grown as an oilseed crop in Illinois and Missouri. It yielded 20 bushels of seeds per acre, which resulted in about 500,000 gallons of castor oil annually.